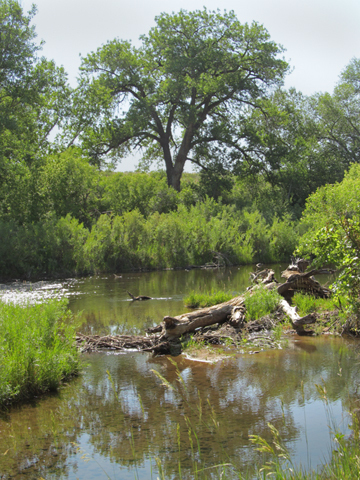 South Platte area in Chatfield State Park, showing much of the forest and riparian habitat that would be inundated at high water levels if the Reallocation Project is pursued (DEIS, Appendix M page 3-13). Kingfisher Bridge is in approximately the same location as the present bridge, but it will have to be rebuilt to accommodate the higher water levels. Please click map to view a larger image. 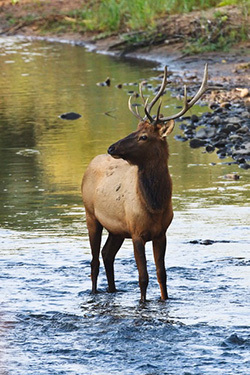 A young bull elk wades in the South Platte River. The Chatfield Reallocation Project would flood approximately 0.7 miles along this section of the South Platte within Chatfield State Park. Trees like those whose autumn foliage is reflected in the water would be cut down. Surrounding areas would be covered by mud flats when water is low. The cottonwood forest that would disappear under the Reallocation Plan has open areas with many grass species and plant communities. Woodpecker holes here provide nesting sites for many other birds, including common mergansers. (Yes, these ducks nest in holes in trees!) 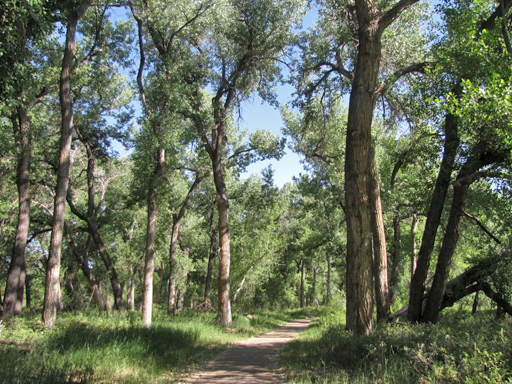 Research indicates that live, mature cottonwoods with large dead limbs, rather than dead trees, may be most heavily used for cavity excavation and thus have the most potential nest sites (J.Wildl.Manage. 50(2):247-252). 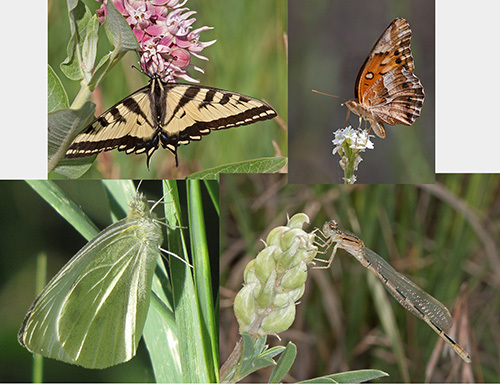 In early summer a variety of colorful insects can be found in the area that the Chatfield Reallocation Project would inundate along the South Platte River. Chatfield State Park’s diverse habitats support more than 300 different bird species. Some are resident. Others come come to nest in the spring and leave in the fall. Still others stop off to refuel to their way to and from more northern nesting grounds. A few spend their summers in cooler locations and winter at Chatfield. 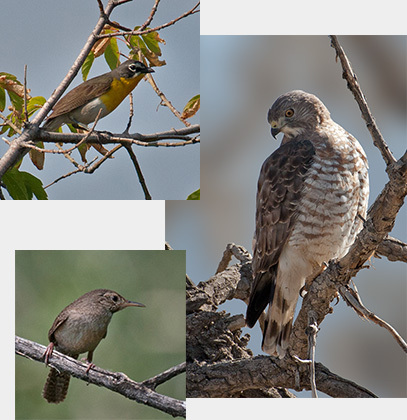 These three birds, a Yellow-breasted Chat, a Cooper’s Hawk, and a House Wren, were photographed in and around the area where the Chatfield Reallocation Project would inundate along the South Platte River. 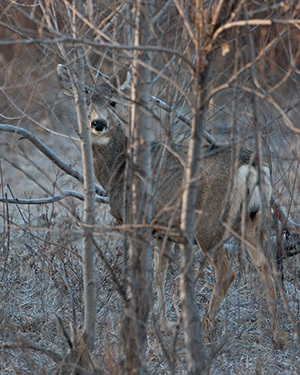 A Mule Deer doe peers out from cover at the edge of a wooded area along the South Platte River. Trees and bushes in this area would be eliminated by the Chatfield Reallocation Project. 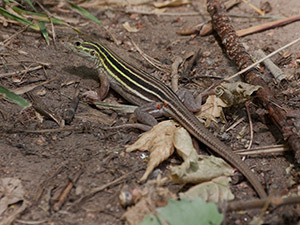 Six-lined Racerunners like this one favor open areas with sparse vegetation. This one exemplifies the rich variety of wildlife supported by Chatfield State Park’s diverse habitats. It was photographed on a fisherman’s trail through a densely wooded area next to the South Platte River. Probably, it wandered there from nearby grasslands where these lizards are more commonly seen. 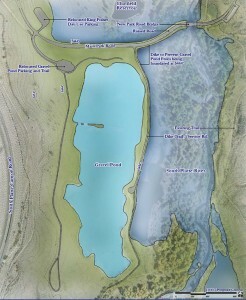 The Chatfield Reallocation Project would periodically flood the area where it was photographed.